How to create a watermark and more special effects to video? How to create a watermark on videos? In fact, it is not difficult to add watermark to video at all. 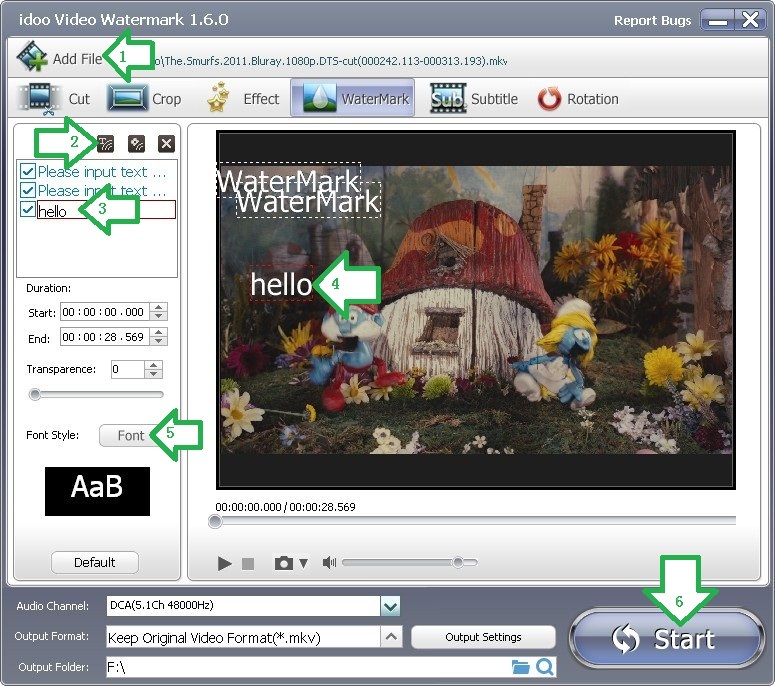 All you need to do is to create a watermark and then add it to video by software. Generally there are two kinds of watermarks: text and picture. Picture watermark need materials ot to create it first by certain software before adding it to your video. However the text ones just can be added directly on the screen by watermark tools. 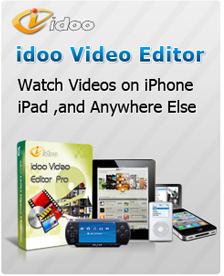 Among so much various watermark software, maybe idoo Video Editor is the one for you. It makes your editing job easy and joyful, and with the integrated powerful functions and format conversion, the editing job is not complicated and boring any more. It may well not enough to add plain watermarks to video to you. Sometimes the position or the font of the text watermark may not satisfactory, how can we perfect the watermarks? You just need to add effects to the text watermark, and idoo Video Editor can help you easily finish this job. The following part will show you how to do it. 2. Click Arrow2 to add a text watermark. You may add more than one. 3. Double click the selected watermark, and put in text in the box (Arrow3). 4. The text will show in the preview box (Arrow4). 5. Click “Font” (Arrow5) to make advanced settings to the text watermark, including fonts, size, special effects etc..
6. Click “Start” (Arrow20) to begin editing. Then to check the output file or edit it. Article Resources Related To 4K Video Editing And Converting Issues(2019) Seven Secrets About Convert 4K Video To Other Formats The Easier Way To Convert 4K Video To 1080P With High Quality What idoo Video Editor can do for YouTube? What can idoo Video Editor do in Windows 8/7/XP? idoo Video Editor: What Does It Mean to Your Samsung Phone How to edit your videos use idoo editing software? Idoo Editor's Tech specs and reference How to cut and trim videos? What Can I Do for you, iPhone 5 and iPhone 5S? How to preview the videos when add the watermarks, and how to convert them into the format we want? How to add watermark to video and add more special effects? How to create a watermark and more special effects to video? How to watermark an image by time settings? How to add batch watermarks to video? How to watermark video? How to add watermark to video? how to cut wmv video? how to cut MP4 video? how to cut mov files? how to cut video clips? How to convert and split video for MAC? How to split audio from video? How to split AVI video? How to split movie by idoo video editor? How to split MP4 video files according to the time span?